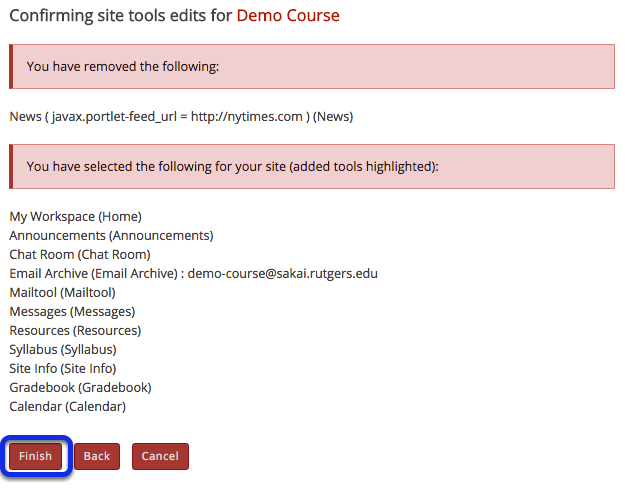 Instructor User Guide NewsHow do I delete a News tool? How do I delete a News tool? De-select the box (i.e. remove check) next to the News tool you want to remove. Click Finish to complete the tool removal. Prev: How do I edit the News tool? Next: What is the Podcasts tool? What is the Assignments tool? How do I add an assignment? How do I edit an existing assignment? How do I enable student peer review for an assignment? How do I enable group submissions for an assignment? How do I delete an assignment? How do I submit an assignment on behalf of a student? How do I grade an assignment? How do I grade a peer review assignment? How do I download assignments for grading offline? How do I upload graded assignment submissions and feedback? How do I release assignment grades? How do I change the Assignments tool permissions? How do students submit an assignment? How do students complete a peer assessment assignment? How do students view their assignment feedback? What is the Calendar tool? How do I customize my Calendar display? How do I view calendar item details? How do I change the Calendar view? How do I add items to the Calendar? How do I edit a calendar item? How do I delete a calendar item? How do I print the Calendar? How do I merge the Calendar with another site? How do I import Calendar entries from a file? How do I modify Calendar permissions? How do I add a chat room? How do I delete a chat room? How do I clear the chat history? How do I change the Chat Room tool permissions? How do I read, post, or delete Chat Room messages? What is the Drop Box tool? How do I upload files to multiple dropbox folders? How do students add items to the Drop Box? What is the Email Archive tool? How do I view Email Archive messages? How do I send messages to the Email Archive? How do I modify the Email Archive options? How do I change the Email Archive permissions? How do students view archived messages? What is the Forums tool? How do I create forums and topics? How do I organize forums and topics? How do I add a new topic? How do I post to a forum topic? How do I reply to a forum post (i.e. conversation)? How do I email a forum post author? How do I delete a forum post (i.e. conversation)? How do I moderate a topic? How do I grade discussion forums? How do I move a thread to a different topic? How do I delete a topic? How do I delete a forum? How do I modify forum template settings? How do I watch or subscribe to forums? How do I view and organize information in Gradebook? How do I set up my Gradebook? How do I add items to the Gradebook? How do I enter and/or edit grades in Gradebook? How do I export grades from Gradebook? How do I import grades into Gradebook? How do I override a course grade in Gradebook? How do I view the course grade override log in Gradebook? How do I set all ungraded items to zero in Gradebook? How does extra credit work in Gradebook? How are grades calculated in Gradebook? How do students view their grades in the Gradebook? How do I setup iClicker Classic with Sakai? How do I import my Roster? How do I run a session? How do I view the session results? How do I sync session scores to the Sakai Gradebook? How do I use iClicker Reef (formerly known as REEF Polling) with the iClicker Classic software? How do I setup iClicker Cloud? What is the Lessons tool? How do I create a new Lessons page? How do I add text to a Lessons page? How do I embed an image on a Lessons page? How do I embed a video from my computer on a Lessons page? How do I embed a YouTube video on a Lessons Page? How do I embed an audio file on a Lessons page? How do I add a website link to a Lessons page? How do I add a file from Resources to a Lessons page? How do I add assignments to a Lessons page? How do I add forum topics to a Lessons page? How do I add tests and quizzes to a Lessons page? How do I add an in-line question to a Lessons page? How do I allow comments to be posted on a Lessons page? How do I allow students to add content to Lessons? How do I reorder items on a Lessons page? How do I delete items on a Lessons page? How do I limit access to Lessons page items to groups? How do I add subpages to a Lessons page? How do I view the Index of Pages? How do I require completion of a Lessons item? How do I rename a Lessons page? How do I delete a top-level Lessons page? How do I delete a Lessons subpage? How do I export Lessons content? How do I import Lessons content? How do I create multiple sections on a Lessons page? How do I create two columns on a Lessons page? How do I create two columns inside a block on a Lessons page? How do I merge columns and sections to one block on a Lessons page? What is the Mailtool tool? How do I send a Mailtool message? How to I set the Email tool options for my site? How do I change the Email tool permissions? What is the Messages tool? How do I view my messages? How do I send a message? How do I reply to a message? How do I create a Messages folder? How do I move a message? How do I delete a message? How do I modify the settings for Messages? How do I determine who site participants can send a message to? What is the News tool? How do I add a News tool? How do I edit the News tool? What is the Podcasts tool? How do I add a podcast? How do I subscribe to a podcast? How do I allow students to upload podcast files? How do I view or download an individual podcast? What is the Polls tool? How do I add a new poll? How do I take a poll? How do I modify Polls tool permissions? What is the PostEm tool? How do I add PostEm feedback? How do students view their feedback in PostEm? How do I post to my wall? What is the Rich Text Editor? How do I check my content for accessibility? What is the Section Info tool? How are sections different than groups? How do I edit a section? How do I delete a section? How do I add site members to a section? How do I add teaching assistants to a section? How do I view student memberships? How do I manage section options? What is the Sign-Up tool? What are Sign-Up meeting types? How do I view meetings in Sign-Up? How do I create a meeting? How do I edit a meeting? How do I lock or cancel a time slot? How do I copy a meeting? How do students or participants sign-up for meetings? How do I export meeting data? How can I use the Sign-Up tool in my site? How do I manually add users to meetings? How do I add meetings to the site Calendar? How do I modify Sign-Up tool permissions? How do I choose which tools will be available in my course? How do I remove users from my course or project? How do I duplicate a site? What is the Site Members tool? How do I view/search the roster? How do I view roster photos and/or profiles? How do I edit Site Members tool permissions? What is the Statistics tool? How do I view summary reports in the Statistics tool? How do I create and run a report? How do I duplicate a report? How do I edit a report? How do I delete a report? How do I print a report? How do I export a report? How do I modify preferences in the Statistics tool? What is the Syllabus tool? How do I create a multi-part syllabus based on number of items needed? How do I add my syllabus as a file attachment? How do I create a syllabus using cut and paste from a document? How do I print the syllabus? How do I point my syllabus to a webpage? How do I create a multi-part syllabus by dates? What is the Tests & Quizzes tool? How do I create an assessment in Tests and Quizzes? How do I create a new assessment using markup text or cut and paste? FAC - T&Q - How do I set up Respondus Lockdown Browser for an assessment? How do I create a new question (with the assessment builder)? How do I create a multiple choice question? How do I create a matching question? How do I create a true/false question? How do I create a short answer/essay question? How do I create a fill in the blank question? How do I create a numeric response question? How do I create a calculated question? How do I create a hot spot question? How do I create a student audio response question? How do I create a file upload question? How do I add multiple parts to an assessment? How do I use assessment parts? What is a question pool? How do I add, copy, move, or delete a question pool? How do I add a question to a question pool? How do I copy questions from the question pool into an assessment? How do I set up a random question set from question pools in my assessment? How do I import and export assessments? How do I import a question pool? How do I share a question pool? How do I revoke access to a question pool? How do I transfer ownership of a question pool? How do I create a survey? How do I view and modify the settings of an assessment? How do I publish an assessment (i.e. test or quiz)? How do I grade Tests & Quizzes? What is the Tests & Quizzes Event Log? What is the Tests & Quizzes User Activity Report? How do students submit an assessment (i.e. test or quiz)? How do students view assessment (i.e. test or quiz) feedback? What is the Web Content tool? How do I create a Web Content link to a web site? How do I create a Web Content link to a folder in Resources. How do I edit a Web Content link? How do I delete a Web Content link? What is the Wiki tool? How do I view wiki pages? How do I search wiki pages? How do I edit wiki pages? How do I create a new wiki page? How do I add images to a wiki page? How do I add attachments to a wiki page? How do I view wiki page info? How do I watch or subscribe to a wiki? How do I view wiki page history? How do I set wiki permissions?